Mix mayonnaise, sour cream, lettuce, tomatoes and bacon in a medium-sized bowl and season with salt and pepper to taste. Refrigerate for at least 1 hour to allow flavors to blend. 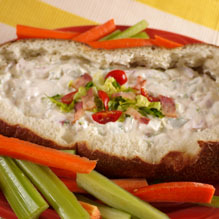 Just before serving, fill hollowed out bread bowl with dip. Top with reserved lettuce, tomato and bacon crumbles. Serve with veggie sticks and bread.